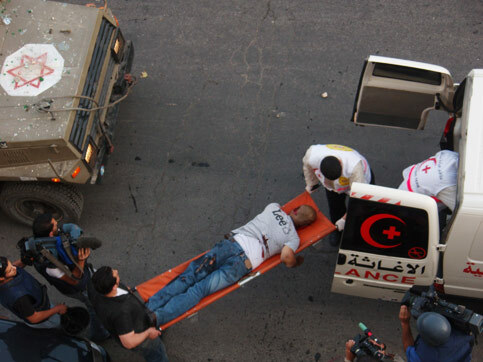 The body of Omar Abu Daher being lifted into a Palestinian ambulance. I must speak up: Your email [about an assassination in Ramallah by Israel military forces] has deeply offended me. If you’re going to send around articles with a view that is so clearly slanted from a Palestinian perspective, could you also please send around articles that are tilted from the Israeli perspective? Otherwise I would have to conclude that your goal is not truly one of spirit-led Quaker reconciliation, but of taking sides and casting blame. There is certainly nothing wrong with taking side and casting blame – it’s been happening for 5,000 years – but then please say that that is what you are doing rather than pretending to be somehow neutral, which your reporting is not, and which the peacekeepers group heading to the region is purporting to be. We might inquire: is the assassination recently [spring 2007] in Ramallah fair, is it just, if adjudicated before a world court, would Israel be deemed innocent, justified in pursuing its “right to defend itself”? at what cost to the world community is this behavior allowed? When I return to Palestine and Israel next October, for another three months, I plan to reside in Ramallah, eat falafel at the Nazareth restaurant, and mourn the absence of international law in Palestine. care to join me? Thank you for replying to my message about the assassination in Ramallah. I am sorry you feel as you do, offended by my remarks. I believe I can understand your feeling, altho I have some other viewpoints; I hope you don’t mind me sharing them with you (at length as it turns out, I apologize for my prolixity). Perhaps you’d like to reply in turn. One of the benefits—if it is a benefit—of my project to photograph in Israel-Palestine what usually is not seen in the States is to raise questions and inspire conversation. First, there are numerous media presentations from points of view favoring Israel. Just scan the corporate media in this country. I feel I’d be redundant doing that. Second, I do not profess to be neutral, I often preface my presentations with thanks to the audience for coming, since the topic is so charged and painful, and then I admit that I’m not a neutral party, I’ve lived with and tried to understand Palestinian experiences and this is what I’ll try to portray. Again, lots of media about Israeli experience, no need for me to duplicate that. Many advocates for Israel, skilled and effective, but who advocates for Palestinians? Third, going directly to one of your remarks, what is the proper role of a Quaker when injustice prevails? I think this is variegated, and not well defined. Some would say, as you suggest, it is to not take sides, but to seek peace and reconciliation, to listen to all sides, to exhibit compassion to all. Our own Everett Mendelssohn embodies this, as do others in our meeting, like Wendy Sanford. Others, like me, feel justice is a necessary precondition for peace and reconciliation. I recall the biblical injunction from Micah to act justly, love mercy, and walk humbly with the divine, but, at least in that admonition, justice comes first. Desmond Tutu headed the Truth and Reconciliation Commission in South Africa, but first and for years he was a courageous, outspoken, death-defying, Jesus-following advocate for justice. I doubt you’d ever find him balancing his call for justice with a depiction of why some support apartheid. You may know that recently Israel banned him from entering Israel: a consequence of speaking truth to power. So goes the “only democracy in the Middle East.” He’s on record as saying, “It is unconscionable that Bethlehem should be allowed to die slowly from strangulation.” And he’s said elsewhere that conditions in Israel-Palestine are worse than the worst of South African apartheid. Fifth, are you equally offended by the news of the assassination? Do you regard it as a right Israel has to “defend itself”? I was deeply offended by the news, especially with my intimate acquaintance with Ramallah and many of its people, including children at the Ramallah Friends School which is in the neighborhood of the killing. Sixth, suppose Canada decided someone they regarded as a “terrorist” resided in Boston. And the Canadian Army, undercover, with no court process, entered Boston, maybe near the Cambridge Friends School or near or in Harvard Square, and murdered that person. Would you be offended? And suppose further that they’d done this twice in the last year, killing upwards of 10 innocent civilians and injuring scores of others, as has Israel in Ramallah. I believe the world would be shocked, and would quickly call for harsh measures against Canada. Why the difference when the invading nation is Israel? Why does even raising the question of holding Israel to international law provoke objections? Seventh, suppose you discovered that an industry or business was severely polluting the ground water in your neighborhood. Would you feel it your duty, when disclosing this fact, to portray all sides evenly? Would you balance the viewpoints of the polluter with those of the neighbors whose water was being polluted, explaining perhaps that the industry believes it has no alternative if it were to remain competitive, that it, by being a corporation, has a right to follow the most profitable business practices, regardless of law and community effects? In the context of a dramatic power imbalance, I do not feel the obligation to balance my presentations. Rather, I recognize the vast imbalance that prevails in the media and Congress: overwhelmingly siding with Israel, nearly always sympathetic. This huge imbalance manifests in at least two ways: the right of return, granting it to anyone anywhere anytime able to establish Jewish credentials, granting full Israeli citizenship, even subsidizing residence in settlements or colonies on Palestinian territory, while denying the right of return to all Palestinians, even those who can prove ownership of property in what is now Israel. The second manifestation of imbalance: the demand that Hamas, before it will be acknowledged as a legitimate government, must renounce the use of violence, honor all agreements made prior to its coming to power, and recognize Israel’s right to exist, while not demanding the same of Israel. And, further, how frequently do we ask a supporter of Israel to include the Palestinian viewpoint? The construction of the wall being built by Israel, the occupying Power, in the Occupied Palestinian Territory, including in and around East Jerusalem, and its associated régime, [is] contrary to international law. Israel is under an obligation to terminate its breaches of international law; it is under an obligation to cease forthwith the works of construction of the wall being built in the Occupied Palestinian Territory, including in and around East Jerusalem, to dismantle forthwith the structure therein situated, and to repeal or render ineffective forthwith all legislative and regulatory acts relating thereto, in accordance with paragraph 151 of this Opinion. Israel is under an obligation to make reparation for all damage caused by the construction of the wall in the Occupied Palestinian Territory, including in and around East Jerusalem. Predictably, Israel—with US concurrence—ignored the decision. Does this offend you? I hope this is useful to you and look forward to any reply you’d like to make. I believe we could go beyond your idea of mourning. You inspired me. What about opening a mourning house in Ramallah like we do for dead people (3 days mourning). The title will be “the death of international law in Palestine.” The idea would be that [a person] from every country [would] come and pay condolences. This would be a great advocacy campaign and I am sure it will capture the attention of Media and [the] international community. I know where to host this and I have enough people and resources to implement it. You will be the main guest at this event.